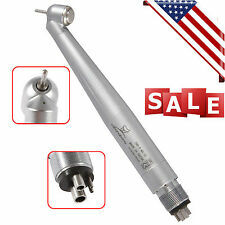 Dental Fiber Optic Handpiece E-generator Internal 3 spray 4 holes YBM. Push button, Triple water spray, LED handpiece integrate E-generator. Back siphonage prevention sanitation handpiece. Unique electric generator, just a little air can generate sufficient power. 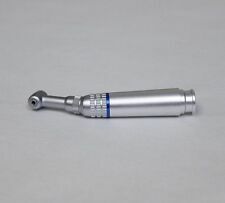 This is a dental High Speed turbine handpiece with Quick Coupler 4 holes which is fit NSK QD-J High Speed Handpiece. 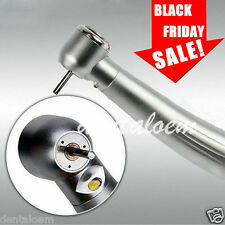 Yabangbang E-generator Dental LED Fiber Optic High Speed Handpiece 4/2 hole. Yabangbang Dental Fiber Optic High Speed Handpiece E-generator Light 4/2HOLE. Contra angle handpiece. 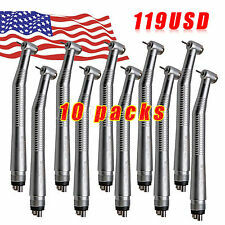 - Contra Angle handpiece 1PC. - Low Speed 22,000-27,000 rpm. -Chuck Type:Push button. We strive to exceed all your expectations and put a smile on your face. Your experience will be a pleasant and effortless one when you buy at BAISTRA. Ti-MAX is the famous of NSK's popular series. -Rotating speed: >350,000rpm. -Suit forΦ1.59~Φ1.6mm 21mm~23mm burs. -Middle head , Push Button. -Self-power LED generator light. -Single Water Spray. PANA AIR PA-S B2 Dentist Dental Fast High Speed Handpiece Wrench Type 2 Holes. Condition is New. Shipped with USPS First Class Package. Max speed of straight head and contra angle: 40000rpm/min. If the item is subject to FDA regulation, We will verify your. The sale of this item may be subject to regulation by the U.S. Food and Drug Administration and state and local regulatory agencies. Dental Files. 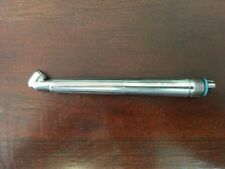 Dental Handpiece. Dental X-ray. Dental Loupe. Dental Burs. You may also like. UPCDoes not apply. MPNDoes not apply. 20:1 Reduction Implant handpiece. NSK type outshape. Pipe fixture. Torque: ≥55N cm. Push Button Chuck. Cap wrench. Stainless Steel Body. Double water system irrigation ( Internal and external irrigation system). (Contra angle with push button and LED light inner water. It is mainly for your piece of mind and comfort.). LED Luminous Intensity: ≥1500LUX. LED Color Temperature: 3500-4000K. Chuck Type: Push Button. High speed handpiece, 3 way spray. Standard Push buttonTriple water spray High Spray Handpiece. Rotation speed:≥300,000RPM. Chuck Type:Push button. Air pressure at the back end of HP:0.25~0.27Mpa (4 Hole). 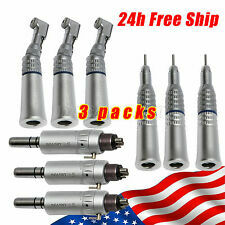 KAVO Style LED Fiber Optic Dental E-generator 3 Spray 4hole Handpiece Turbina. KAVO Style Fiber Optic Dental E-generator LED 3Way High Speed handpiece 4Hole. Push button, Triple water spray, LED handpiece integrate E-generator. (Push button, Triple water spray, LED handpiece integrate E-generator. Back siphonage prevention sanitation handpiece. Unique electric generator, just a little air can generate sufficient power. It is mainly for your piece of mind and comfort.). Dental Handpiece. Inner water spray contra angle handpiece. Dental Files. Dental X-ray. Dental Loupe. Dental Burs. ROTATE SPEED：≥18.000r/min. Air Scaler. 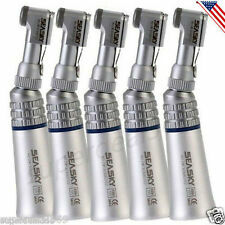 NEW Dental Slow Low Speed Wrench Type Handpiece Contra Angle Latch Bur. Contra angle handpiece. 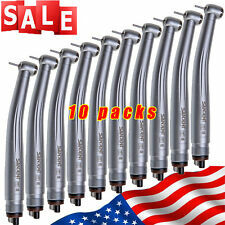 - Contra Angle dental handpiece: 1 each. We're one of the largest online dental suppliers based on many qualified manufacturers in China. 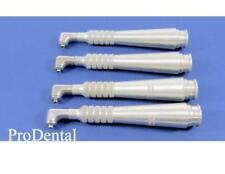 Dental Handpiece. Dental Files. Dental X-ray. Dental Loupe. Dental Burs. You don't need any special fiber optic source. The tubine has a built in generator that powers the LED light bulb. One year Warranty. Inserthion should be the full length. For dental use only. Practicable for using auto-clave. Do not use high pressure steam sterilizer which heats more than 200 degree drying process. Avoid levering, tilting, twisting and jamming motion. Original BODE 20:1 Reduction Implant Surgery Contra Angle Handpiece. Dental Handpiece. Dental Files. Dental X-ray. Dental Loupe. Dental Burs. CHUCK TYPE:push button. BUR APPLICABLE:Φ2.345-2.355mm for low speed bur.